Wayward is a… I guess I’d call it a mystery SF thriller… the second of a trilogy written by Blake Crouch and published in 2013 by Thomas & Mercer. 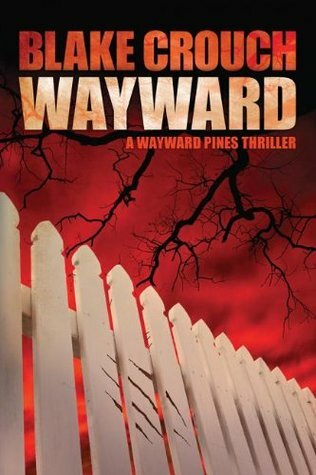 If you follow reviews on this site regularly, and this one seems familiar, that’s because I’ve already posted a TV review of Wayward Pines Season 1 which is based on Blake Crouch’s trilogy of books and covers a similar set of events as the trilogy of books. And I recently posted a review of Pines, the first book in the trilogy. The first book relied a lot on big mysteries for a lot of its appeal and revealed many of those mysteries at the end. I can’t talk about book 2 without talking about those mysteries, so if you want to be surprised go read the first book. To give a quick recap of the first book, Secret Service agent Ethan Burke and his partner travel to Wayward Pines, Idaho to investigate the disappearance of two Secret Service agents. They get in a car accident in town and Ethan wakes up in the hospital, and something is very wrong about the little town. There are all kinds of bizarre rules, such as no one is allowed to talk about their past, and everything about the town seems set on forcing its residents to stay–the only road that’s supposed to lead out of town just loops back into it. Ethan fights hard against the town and becomes the target of a fete–where the sheriff of the town leads the citizens of the town to find and kill someone who has broken the rules. Ethan survives the fete and because of his resourcefulness he is let in on the secret of the town. David Pilcher, the secret leader of the town, has had a decades-long project that started when he discovered that the human genome was becoming corrupted and the human species was quickly changing into something else entirely. When no one believed his research, he set out on a project to preserve as much of humanity as possible, gathering people he could trust to act as his staff and collecting others against their will. His research perfected the technology of cryogenic sleep and he put all of these people (including Ethan) into cryosleep. 1800 years later he and his staff woke up to find that his prediction had come true–the world as far as they could explore had been overrun by the evolutionary descendents of humanity–which they dubbed aberrations (or abbies for short)–vicious human predators. They set out to rebuild Wayward Pines, protected by sheer cliffs and a high voltage fence and then woke up people to populate the town. During his first attempt to populate the town he tried telling people the truth, but suicide rates quickly rose, and he salvaged what he could by starting over again (putting people in cryosleep erased their memory since the last sleep). David Pilcher names Ethan Burke as his new sheriff to help enforce the rules of the town and keep people safe both from the abbies outside the wall and to keep the growing discontent among the townspeople from exploding into revolution. Phew, sorry, long back story, but most of that’s important to understanding the basic plot of this book. Near the start of the story Ethan Burke discovers a corpse of a woman who has apparently been murdered, and Pilcher assigns him the task of investigating. Although the violent fetes are a part of life in Wayward Pines, unsanctioned murders are rare, due in large part to the constant surveillance of the residents. The murdered woman was one of Pilcher’s employees working in the mountain to oversee the surveillance and discipline of the town, and she had been venturing into town in the guise of a townsperson to root out the secrets of a group of residents who have found ways to dodge the surveillance. Meanwhile, Ethan has been reunited with his wife and son–when he first came to Wayward Pines 2000 years before he came there before her, and she was taken by Pilcher more than a year later. But, skip forward 2000 years, and she and their son was woken from cryo more than 5 years before him so she has already settled into living in the town by the time he arrivs. Although the setting and protagonist the same, this book has a decidedly different feel from the first book, Pines. The first book feels more like weird fiction because of the unexplained oddities of the little town and the constant attempts of the protagonist to pick at the edges of the strangeness. By the start of this book Ethan has a much clearer idea of what’s going on and has been drawn into the conspiracy himself, so rather than being in the position of rebellious loner he is a family man in a position of precarious power whose job is both to protect and oppress the people of the town. He hasn’t lost his rebellious nature, but he is in a very difficult position. The mystery of the murder made a good centerpiece for the book, (and was a surprise to me even though I’d seen season one of the TV show because of changes in the adaptation), and Ethan’s interactions with Pilcher are a constant source of new information to understand the situation this little town is really in. The most interesting new addition to me that differentiated this book from the first one is to see more deeply into the point of view of the staff that live in the mountain surveilling the town. While the people in the town yearn only to get out of the town, the people in the mountain yearn to get into it–to live under the open sky and be able to live a comparatively carefree life and just forgetting all the strangeness around them. That was an interesting dichotomy to read about, and one that was largely absent from the TV show. The book is interesting throughout, and manages to avoid the Book Two Slump of many series. Although it depends on knowledge from the first book and leads directly into the events of the third book, it has an arc that stands on its own that starts with the major change of Ethan being promoted to sheriff and ending with major events that lead into the third book’s story.